The ASUS ROG Swift is a gamer’s gaming monitor. 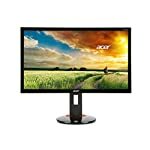 If you are in the market for a monitor that is going to look great with games then this is a screen that won’t disappoint. The PG278Q is proving very popular right now thanks to its compliment of fast refresh, fast response and adaptive synchronisation technology. With a 2560 x 1440 resolution it sits right in the sweet spot of resolution versus quality on a 27 inch monitor. If you browse the forums and look at what gamers are going for you’ll see that the ASUS ROG Swift line is constantly recommend for the serious game player who wants fast response and high refresh rates. That said, other manufacturers have been watching the new demand for high performance gaming monitors and the competition is catching up swiftly (no pun intended). For example the Acer Predator range. The first thing you notice when you look at the physical qualities of the ROG Swift is the minimal bezel. If your preference is for a thin edge to your screen then you’ll pleased with the appearance of this monitor. The screen itself is covered with an anti-glare layer that is actually noticeable but won’t detract from game playing. On the plus side the clarity of the image is fantastic with images looking as sharp as could be expected. Like other game orientated monitors, there is a red ring around the base that glows. This looks kinda neat and will pair well with an illuminated rig should you go in for that kind of thing. It’s not something that sells a monitor to me but each to their own! This monitor does really look the part, beautifully designed, it will look great on anyone’s desk when on or off. The stand is solid and stable and moves in a smooth manner. It can be rotated into portrait mode, a nice touch but a feature I don’t think many gamers will use. Other adjustments include 120 degrees of swivel, 25 degrees of tilt, and 4½ inches of height adjustment. You’ll have no problems adjusting it to sit just the way you need it to go . USB 3.0 ports are included and just a single DisplayPort connector for hooking up to your graphics card. This makes sense as only the DisplayPort cable would be able to power this monitor’s features. The Swift comes with Ultra Low Motion Blur (ULMB) technology. This can’t be used at the same time as G-Sync and only at refresh rates of 85, 100, or 120Hz. This feature suits games that output a constant frame rate but doesn’t work so well with fast paced games with a variable frame rate. Fortunately this monitor also comes with G-Sync, switching this on will reduce the chances of screen tearing and stutters. In either case you will get low input lag and and decent response time thanks to the 1ms TN panel that can react to whatever is going on in your game. Something that doesn’t often get mention, the switch on time of this monitor is fast, it doesn’t take time to ‘warm up’ and although a logo is forced upon you it doesn’t linger around for long. This is great when you have a SSD drive on your PC, I used to have an old monitor which ended up being the bottle neck to my startup! We give the Asus ROG Swift PG278Q a 4 out of 5 rating. Want to know what existing owners of the monitor think? You can read real user reviews here. 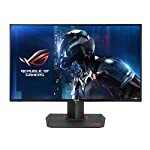 Should I buy the Asus ROG Swift PG278Q? Welcome to the Asus ROG Swift PG278Q FAQ. This section attempts to answer common questions you may have, please get in touch if you have any more queries or if you think our answers need updating. Do these features benefit AMD cards for example R9 380? This is a G-Sync monitor which is designed for use with compatible video cards. You will not be able to benefit from these technologies with an AMD card. If screen tearing worries you, go for a FreeSync monitor. 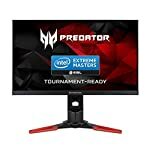 Can it run 2K at 144Hz? Yes, this monitor is designed to run at 2560 x 1440 at 144Hz. 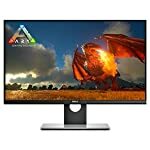 Would this be a good monitor for PhotoShop? 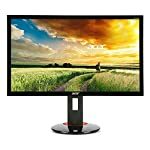 This monitor uses a TN panel and is really aimed at gamers. Whilst colour reproduction is good you might want to consider an IPS based monitor which traditionally gives better image quality. There is little point in paying extra for gaming features if this is not your priority. Can this be mounted on a triple-monitor arm? Shouldn’t be a problem, the monitor has standard VESA mounts so should be compatible with any appropriate mount.